What is the F.INV (Inverse F Distribution) Function? The F.INV function is categorized under Statistical functionsFunctionsList of the most important Excel functions for financial analysts. This cheat sheet covers 100s of functions that are critical to know as an Excel analyst. It will calculate the inverse of the Cumulative F Distribution for a supplied probability. As a financial analystFinancial Analyst Job DescriptionSee a real Financial Analyst Job Description including all the skills, experience, and education required to be the successful candidate for the job. Perform financial forecasting, reporting, and operational metrics tracking, analyze financial data, create financial models, the function is useful in understanding the variability of two data sets. One example is when we wish to analyze the income diversity between two regions where the company sells its products. Probability (required argument) – It is the probability at which we evaluate the inverse Cumulative F Distribution. The value is between 0 and 1. If p = F.DIST(x,…), then F.INV(p,…) = x. Here, we need to remember that the F.INV function is the inverse of the cumulative form of the F.DIST function. 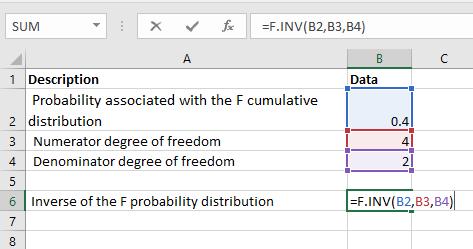 How to use the F.INV Function in Excel? The probability that is provided is less than 0 or greater than equal to 1. In MS Excel 2010, the F.INV function replaced the FINV function for better accuracy. FINV is still available in Excel but only for compatibility purposes. To keep learning about Excel functions and developing your skills, check our Free Excel Crash Course! Learn how to create more sophisticated financial analysis and modeling to become a successful financial analyst.